On our trips to Thailand there are many temples that we visit year after year; one of these is Wat Mahatat in Nakhon Si Thammarat. 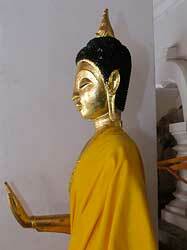 Over the years I’ve come to especially love one Buddha statue there and have photographed it frequently. The full name of the temple is Wat Phra Mahatat Woramahawihaan, sometimes abbreviated to Wat Phra Boromathat. It is found a couple kilometers from the town center on Thanon Ratchadamnoen, the long street that runs the length of the town, and is easily reached by songthaew. This first picture shows the statue as I saw it in 2004. It shows a beautiful, stone statue that has weathered over the years. 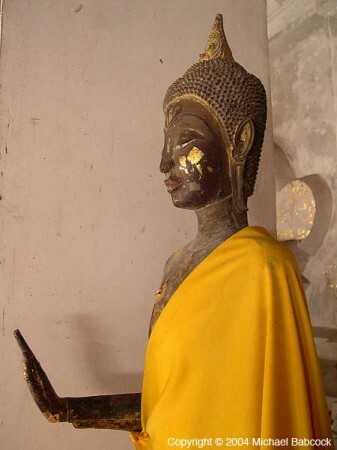 The cheeks have been gold-leafed by worshippers and the statue is dressed in a plain orange robe such as a simple monk in Thailand would wear. 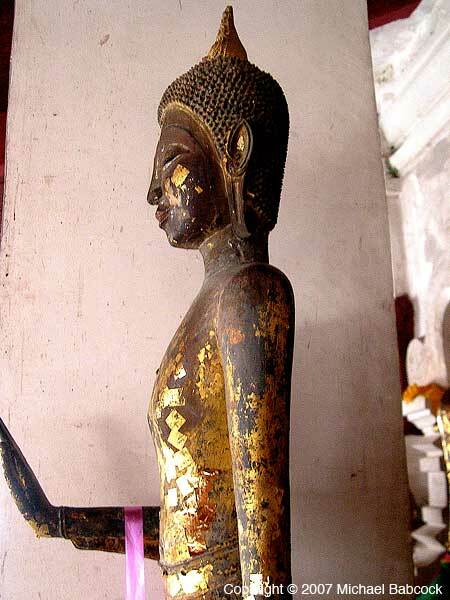 The statue is one of many found in the Thap Kaset Congregation Hall, also knows as “The Gallery at the Foot of the Buddha’s Relics.” It’s a wihaan (or viharn) or meeting room found to the left of the main chedi – there’s a blue sign with an arrow pointing to it. Once you enter there’s a quadrangle with two levels of Buddha statues. It’s a quiet, peaceful place. Absence of fear – either one or both arms are shown bent at the elbow and the wrist, with the palm facing outwards and the fingers pointing upwards. 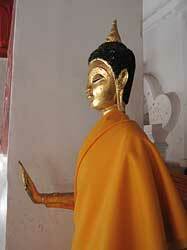 It shows the Buddha either displaying fearlessness in the face of adversity, or encouraging others to do so. The right hand raised is also referred to as “calming animals” and both hands raised are also called “forbidding the relatives”. The next picture (to the right) from 2006 shows the statue substantially unchanged except that it’s now wearing a fancier robe – obvious when you click on the image to bring up a larger version of the picture. I like this picture to the left from 2007 because it shows the Buddha statue without the orange robes: you can see how the body has been gold-leafed by worshippers over the years. You can see how the gold leaf on the face has weathered. So it came as a bit of a surprise, and not a pleasant one, when in 2011 I arrived to find that the statue had been painted over in gold and black. Instead of an beautiful, aging statue the image now appeared to me to be new and garish, almost like a person who can’t accept that they are growing older and is doing everything in their power to stay young. The change in the Buddha ended up being a useful teaching for me. 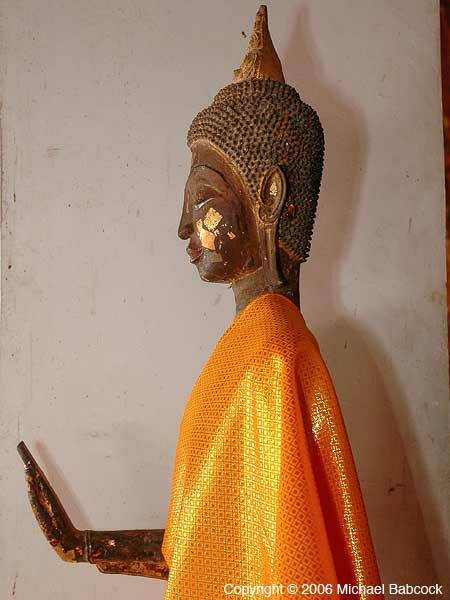 This periodic painting of beautiful old statues is not new for me in Thailand. It first happened at a temple in Chaiya many years ago. I should not have been surprised. Things age quickly in Thailand and there are often efforts to make things look new again. On reflection, it turns out to exemplify the fact that “everything that has the nature to arise has the nature to cease.” In this case, my beautiful “old” statue ceased: it arose as a painted “new” statue. It appears as if Kondanna became enlightened by realizing the truth that “Everything that has the nature to arise has the nature to cease” – not just as an intellectual concept but as an absolute knowing that informed the way he approached the world. If we look carefully, at this picture from 2013, two years later (click on the picture to see a larger version), we can see small indications that the gold paint is already starting to age. It will be interesting to continue my yearly visits and to see how the statue continues to change, continues to age, continues to exhibit the nature of all conditioned things: arising, abiding for awhile, and then ceasing. Wat Mahatat in Nakhan si Thammarat. Be sure to watch the slide show. This entry was posted on Monday, July 1st, 2013 at 12:05 am	and is filed under Buddhism. You can follow any responses to this entry through the RSS 2.0 feed. You can leave a response, or trackback from your own site.